Use the interactive widget below to help identify St. Louis-area playgrounds with accessible elements. 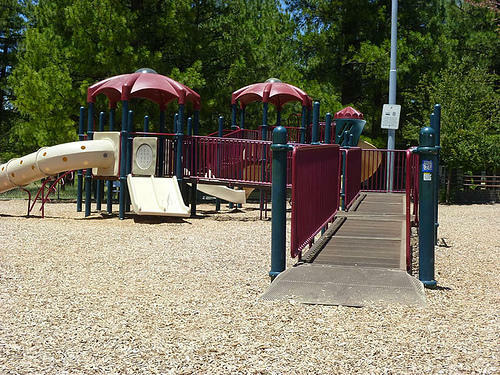 Or, if you're looking for an accessible playground, you can also search for one near you. Have a story or comment about this topic? We'd love to hear from you. Comment below this story or feel free to email Kelsey Proud at kproud@stlpublicradio.org. U.S. CDC Pediatric Nutrition Surveillance System, 2008-2011. *Represents statistically significant annual decrease or increase in obesity. Updated at 5:30 p.m. to adjust y-axis units on graph and to add second map. It's not a big change, but it's at least in the right direction. 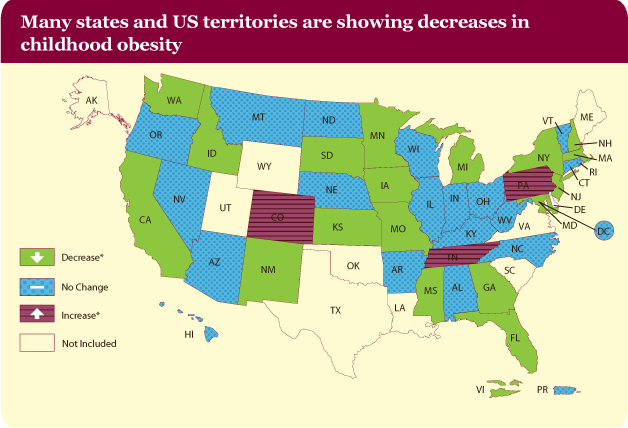 According to a new report released this week by the U.S. Centers for Disease Control and Prevention, the prevalence of obesity among low-income preschoolers (ages 2-4) declined by at least one percentage point over the period from 2008 to 20011 in 18 states and the U.S. Virgin Islands.